Tipster Natalie sends along this incredible/weird image from the Oregon-Arkansas State game a couple of weekends ago in Eugene. It really requires no further explanation, but Natalie says the photo was taken by her son, whose friend is the creep in the crown mask. (Sorry, if you're in a clown mask for any reason, you skip all previous spaces and proceed straight to Creepville.) 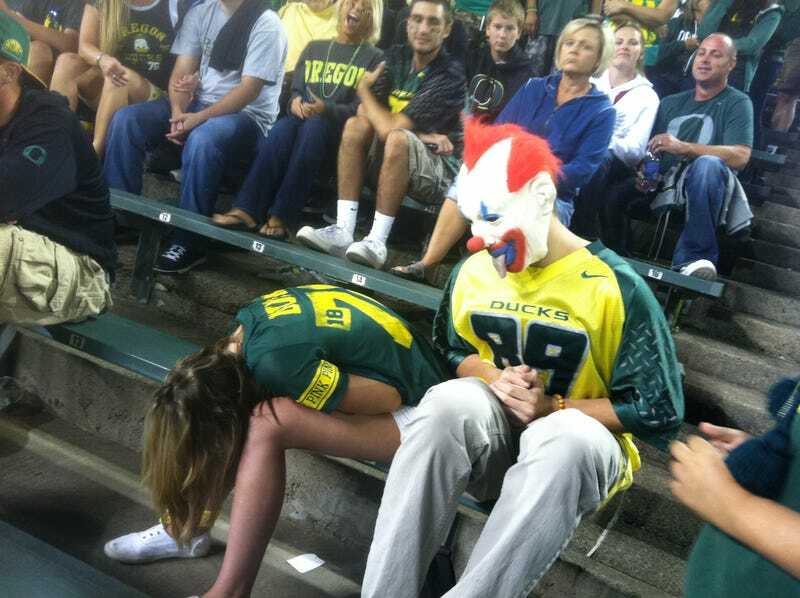 She says the clown was implored to go sit next "to the drunk Ducks fan who was abandoned by her friends." The reaction, by all parties involved, is absolutely priceless, and be sure to click the photo to get the full effect of what's happening. All in all, it's been a good week for fan photos at football games.